A quick overview of JPA single table inheritance strategy. In this strategy, all the classes in a hierarchy are mapped to a single table. 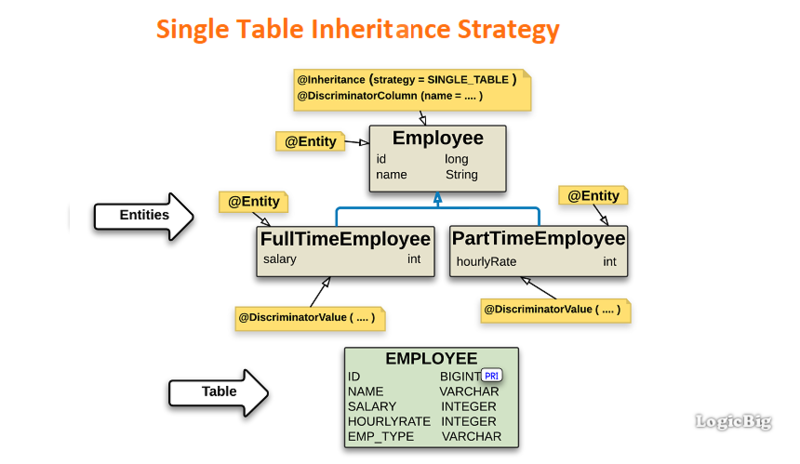 The annotation @Inheritance is used on the root entity class with strategy = InheritanceType.SINGLE_TABLE. @DiscriminatorColumn is used on the root entity class to specify the discriminator column attributes. Discriminator is a way to differentiate rows belonging to different classes in the hierarchy. @DiscriminatorValue is used on each persistable concrete class to specify a unique discriminator value. The root class can be abstract or a concrete class. An abstract entity differs from a concrete entity only in that it cannot be directly instantiated. This is the default inheritance strategy. That means if we don't specify the strategy attribute of @Inheritance annotation on the the root class or don't use this annotation at all , then InheritanceType.SINGLE_TABLE strategy is assumed. This strategy has the disadvantage of having rows with null column values for which the entity has no corresponding fields.